There was a time when a 955cc Ducati would have been pinnacle of performance from the Bologna factory, but the firm’s the new 959 Panigale is now regarded as ‘Supermid’ in Ducati’s own language. The new bike has been given a wealth of performance and cosmetic tweaks in order to reinvent the current 899’s design after two years on sale, but also to ensure the bike can pass Euro4 emissions and noise regulations. Clearly, getting the bike through Euro4 in terms of noise was a fairly tough job judging by the size of the enormous shotgun-like twin exhaust stacked on the 959’s righthand side. The new exhaust is a massive change from the outgoing bike’s slender flanks, and almost invisible under belly exhausts, and could well be a portent of what’s to come for many manufacturers as the Euro4 legislation comes into force, with even tougher regulations set to follow. The new V-twin engine in the 959 Panigale is the first of the Superquadro engines from Ducati to pass Euro4 regulations, with the 955cc unit now developing 157bhp at peak; up from 148bhp on the outgoing 899 Panigale. The current 1299 is not Euro4 compliant – so expect some side cannons on that for 2017 if they can’t design a better solution. Thankfully the 959’s genuine aftermarket cans are still underbelly like the 1299s – and cost £1311.60. Peak torque has also been lifted to 79.2ftlbs at 9000rpm, all thanks to the additional 57cc gained from a longer piston stroke, increased from 57.2mm to 60.8mm, while the bore remains the same at 100mm. In order to achieve the increased stroke Ducati have redesigned the crankshaft with a new crank journal lubrication system to match. New conrods have also been designed while the compression ratio remains unchanged. Reducing internal friction is a big part of being able to pass Euro4 as not only does it reduce emissions because of the greater efficiency of the engine but it also helps to reduce mechanical noise. In this way a new Diamond Like Carbon (DLC) coating on the piston pins and a redesigned piston crown, a pair of new cylinderheads and aluminium top covers with a ribbed design have been installed in order to reduce mechanical noise. A new cam-timing chain has been installed for the same reason too. Oval throttle bodies are now joined by twin fuel injectors; one above and one below the butterfly, and these are independently controlled by the ride-by-wire throttle system. 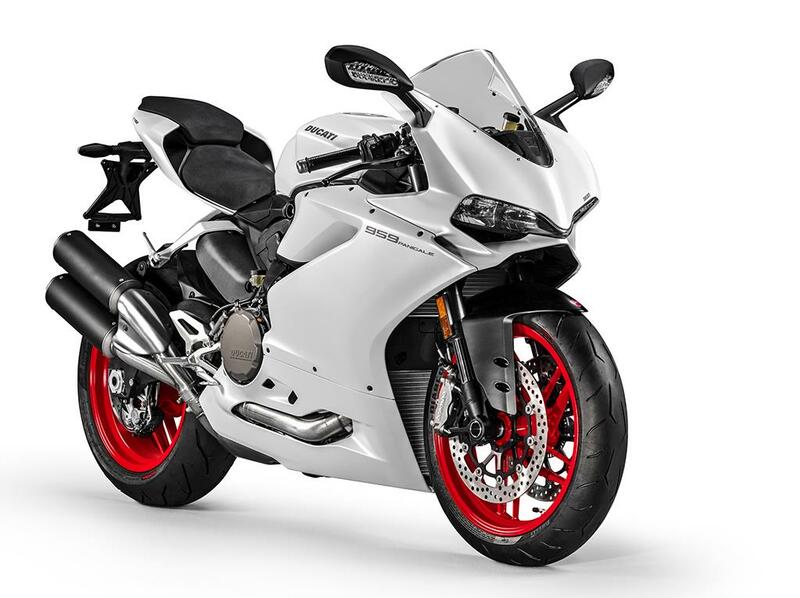 The new engine uses the Ducati secondary air system, which works to maximise the most efficient burn of the fuel/air mixture and prevent unburnt hydrocarbons being emitted. The clutch has a new innovation for an engine from the Superquadro family with a new ‘self servo’ mechanism that reduces the effort needed to operate the clutch. This same mechanism also works in reverse as slipper clutch to prevent back torque locking the rear wheel. 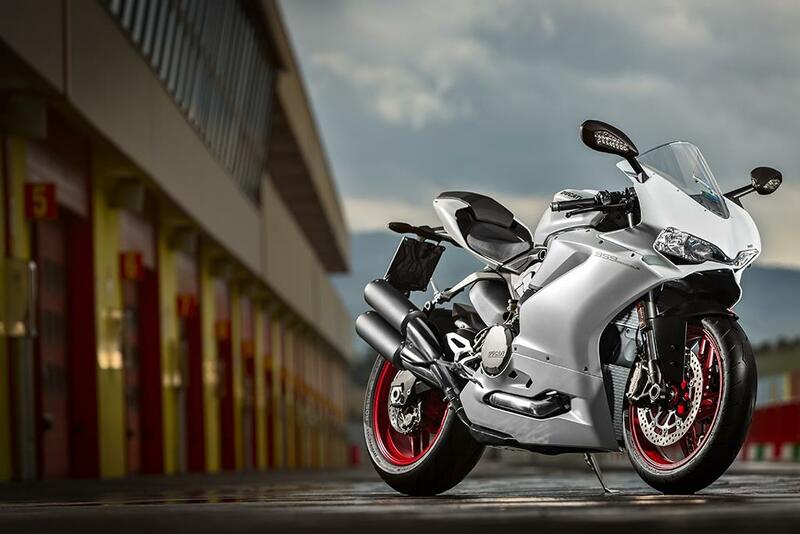 Despite the increased power and torque Ducati have kept the service intervals the same as the 899, with a major service needed at 15,000miles to check valve clearances and an interim service at 7500miles. 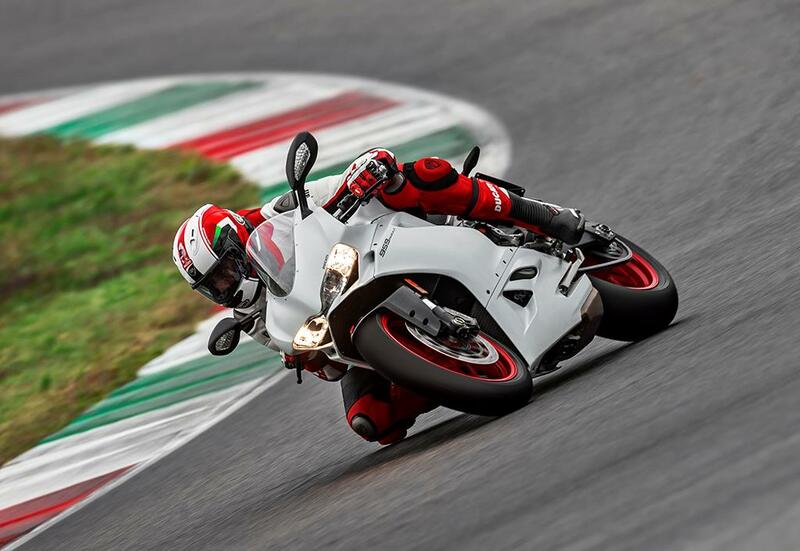 What else is new for the 959 Panigale? 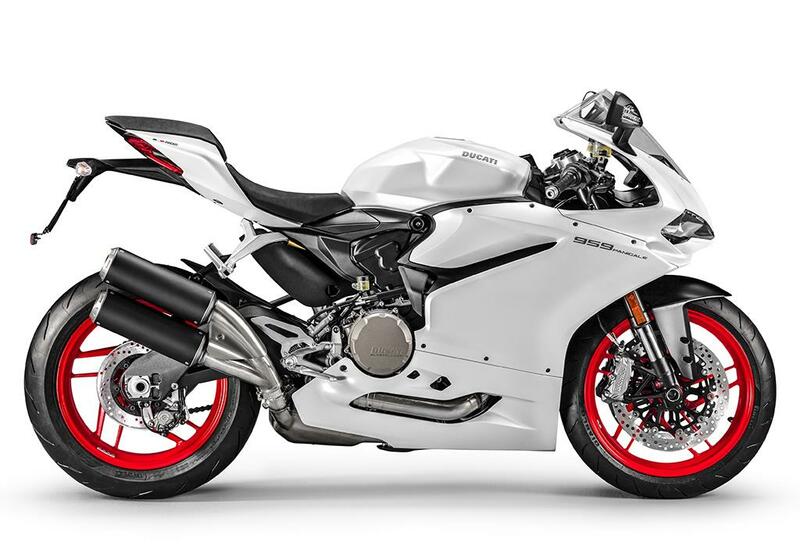 Other changes follow those made to the range-topping 1299 Panigale released at the start of 2015, and include a wider and more protective front fairing which came as a direct result of feedback from the factory World Superbike racing team. Not only is the fairing wider, but it also features a wider and taller windscreen, and larger diameter air intakes to ensure the airbox can gulp plenty of fresh air at high speeds. The seat unit has also been comprehensively reworked to follow the same design as the bigger 1299 Panigale range. New rear view mirrors and different fairing ducts also mimic the 1299’s. 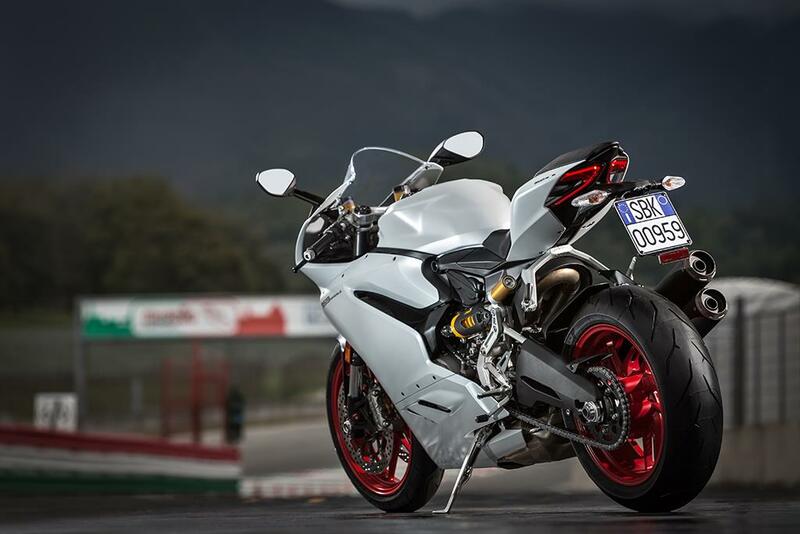 The 959 Panigale will cost £13,095 in red, or £13,295 in white. Electronics: The 959 gets the full glut of Ducati electronic rider aids including traction control, a quickshifter, engine braking control, ride by wire, adjustable riding modes and adjustable ABS to suit road or track conditions. Dash: The black on white LCD display displays a wealth of data including revs, riding mode selected, ABS, traction control and engine braking control settings, speed, gear position but also has a stopwatch function along with max speed and maximum rpm achieved too. Ducati Data Analyser (DDA): Available as an optional extra, the DDA is a plug and play datalogger which can be used to store and analyse the performance of the bike in terms of lap times, throttle position, speeds and lots more. Chassis: Just like the 1299 Panigale, the 959 uses the engine as a stressed member of the chassis with a small monocoque section attaching to the cylinderheads to form the airbox. The chassis geometry has also been altered with a 4mm drop to the swingarm pivot mount.